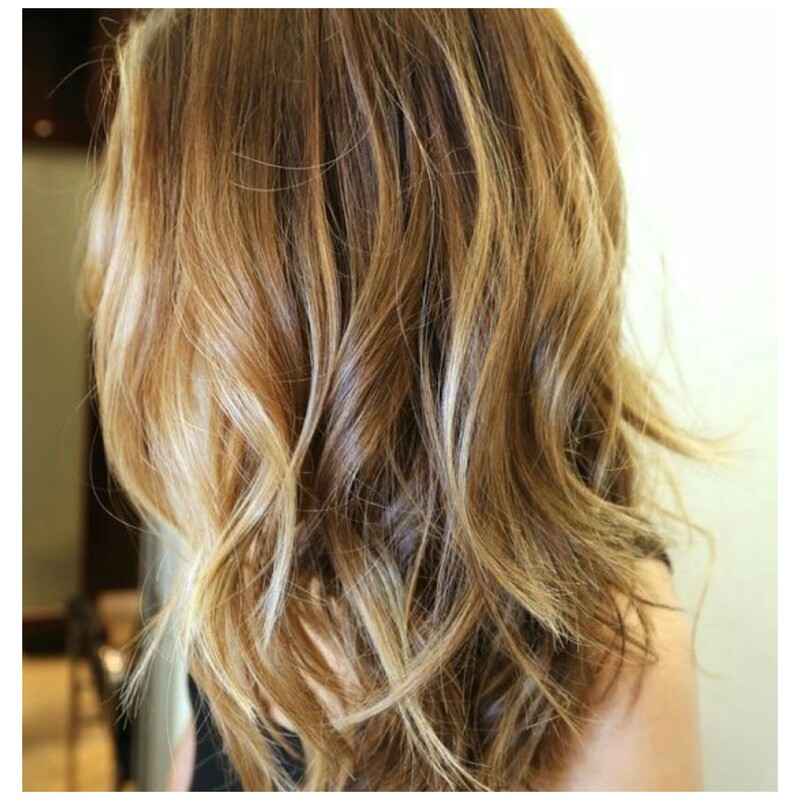 How do the newest hair color trends differ? Many if not all clients these days come into the salon armed with a photo on their phone that they have pinned from Pinterest. “I want my color to look like this” they say as they point to the picture. This post is meant to explain the differences and similarities in hair color trends that are currently being seen daily in the salon and across the country right now. 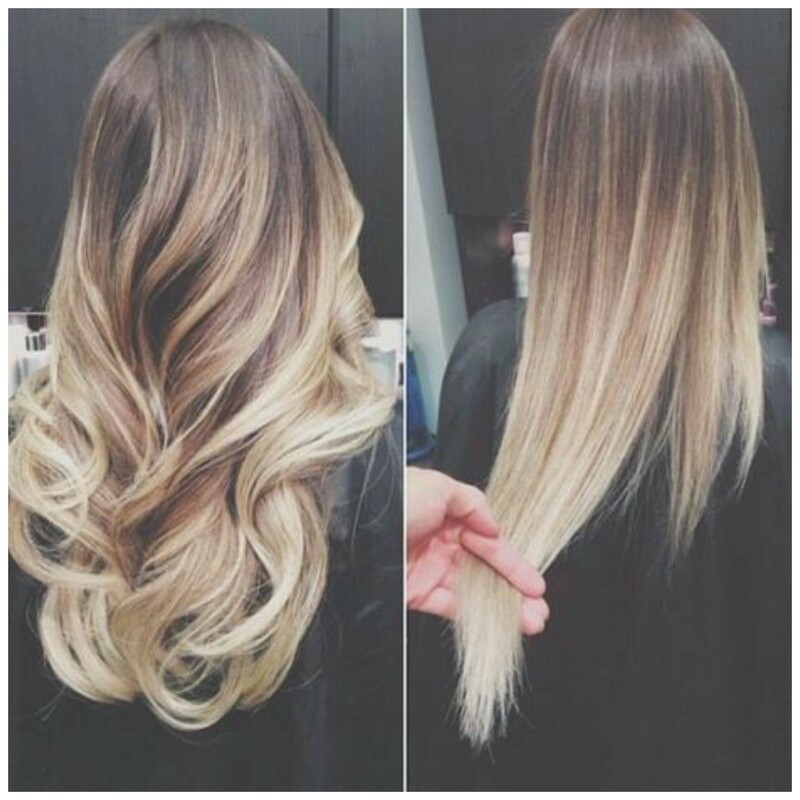 Ombre, Sombre, Color Contouring, Balyage. Every day we are performing these different color services, all with their own name and all having slight variation, but all these services originated from Ombre!! 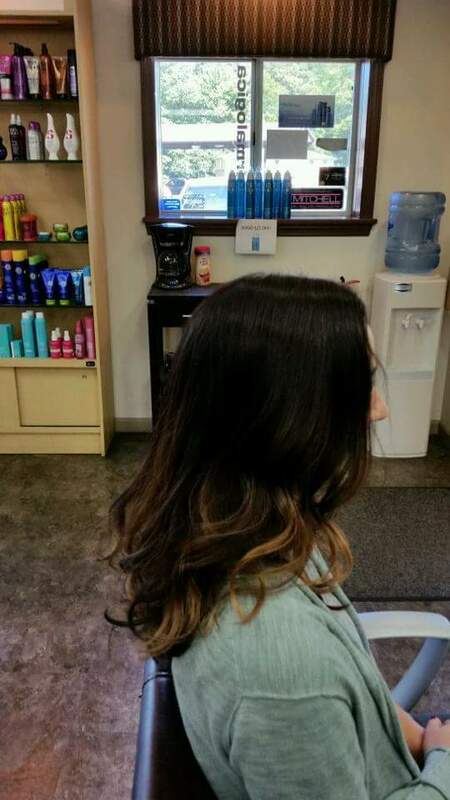 If you look around you, on pinterest, or in any magazine, you will see many examples of these trends and see that Ombre type color services are not going away anytime soon! 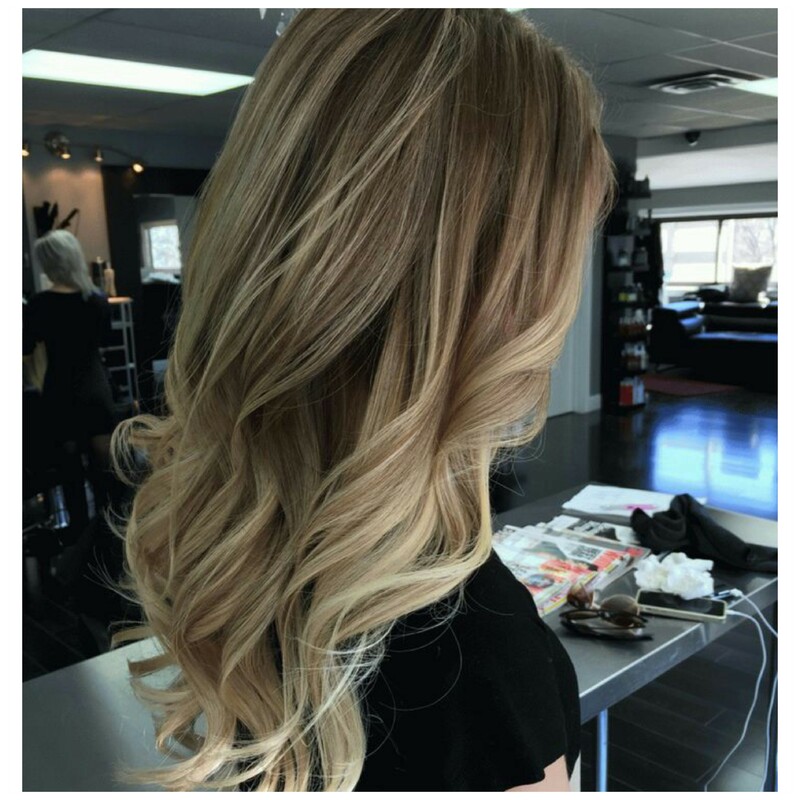 Clients love these low maintenance colors,having their roots darker and ends lighter and having a style they can tweak slightly each appointment constantly creating a new look.So Lets see some similarities and differences of these techniques to better help you decide which one is best for you! *Softening areas of concern on the face by making the surrounding areas lighter to soften the features. 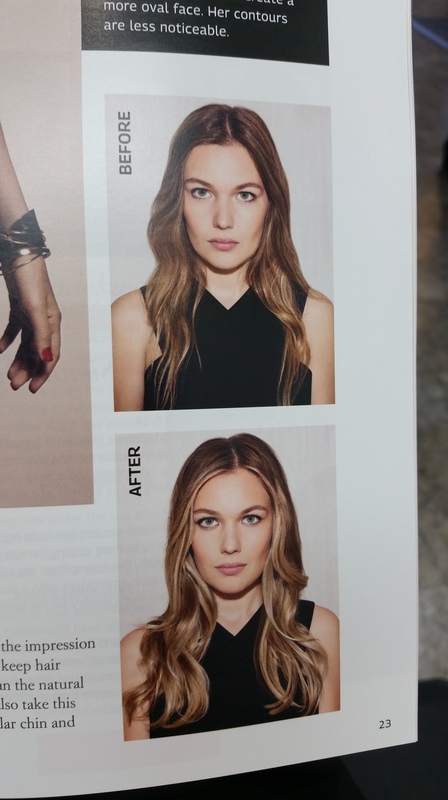 Example- A Square shaped face would want the forehead and jawline area softened with highlights to make them appear less harsh. 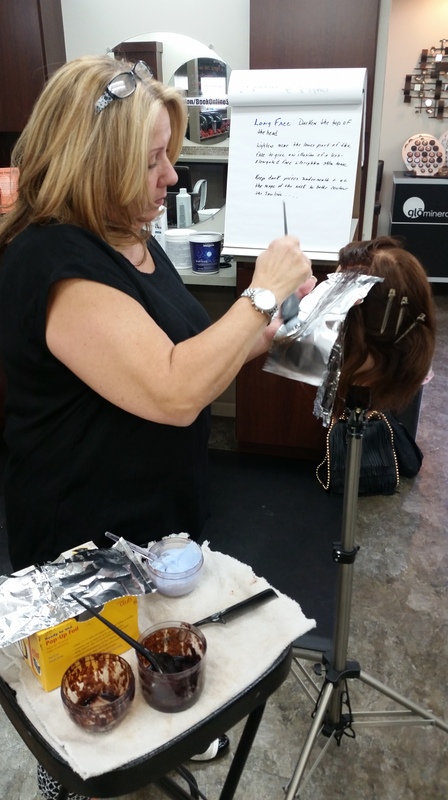 We just had a class last week on Color Contouring from our Loreal Professional educator Kim. She travels to the salon from Philidelphia to instruct us on the latest and greatest techniques and products in the salon world. We got to learn all the different techniques and placements used for Contour Coloring. As you can see in the above photos from the class, it can really make a big difference in how your face shape is perceived!! Take advantage of our Nail special!! We have a nail special going on in the salon right now!! You can get a manicure(reg $18) and a pedicure(reg $36), for $40!! If you add on gellish polish you get it at 1/2 price(reg $23)! This is a great deal! Take advantage of it is you have special plans for the weekend, or want something fun for Halloween. We also do Halloween and regular nail art! :) Call the salon at 724-349-5444 or schedule online through our website at http://www.cameronsalon.com. Hurry, offer won’t last long!! 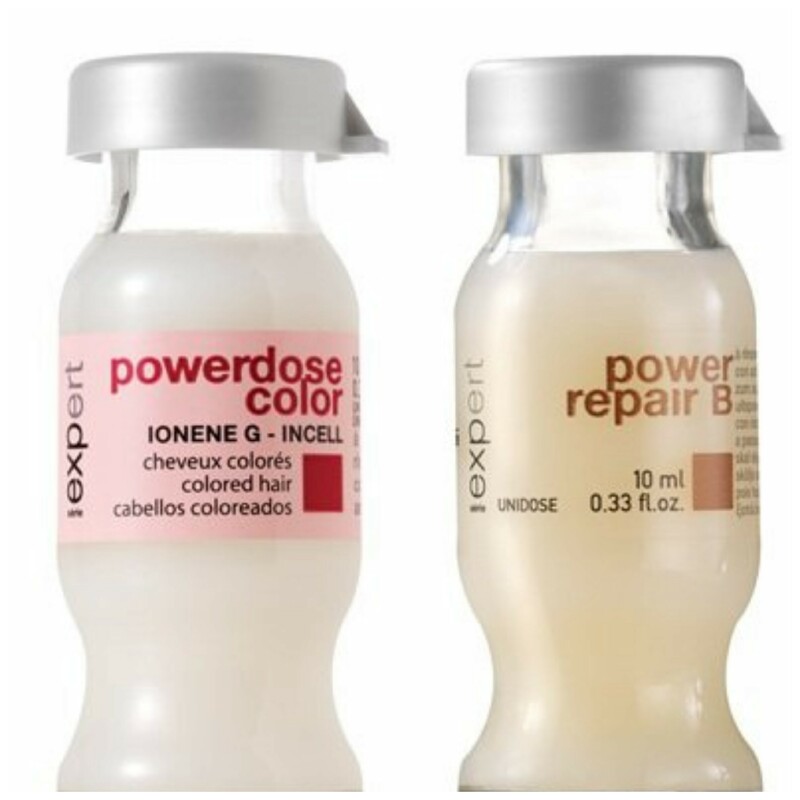 As I promised in my last post, I am going to share some info on my favorite Loreal Professional product as well as some info about our Powerdose treatments we offer. If you are looking for top of the line products for your hair and instant results- look no further! It doesn’t get any better then the Loreal Professional line! The Loreal Professional Powerdose Treatment. 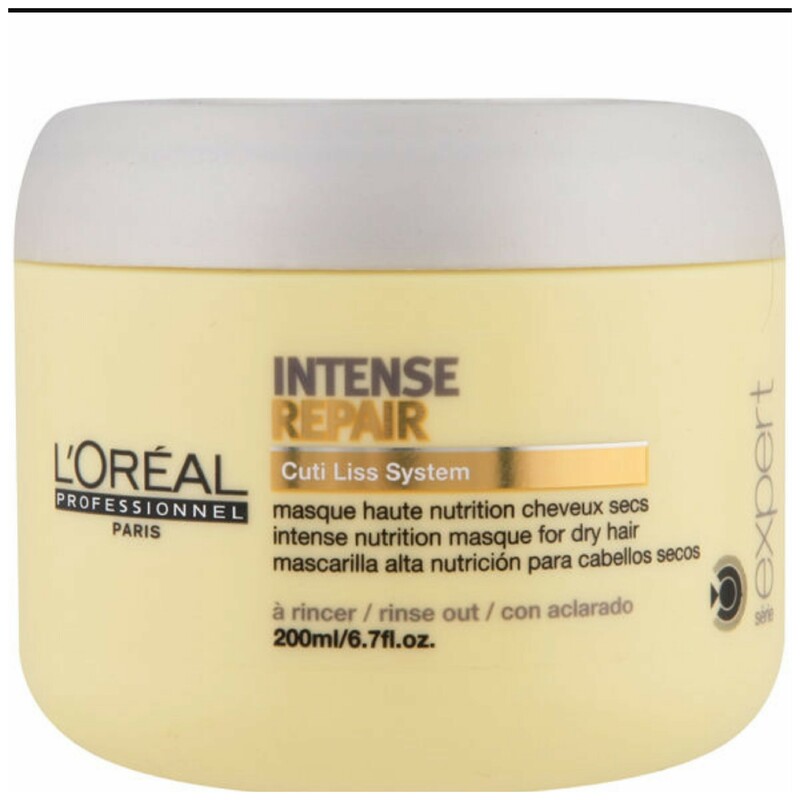 The Loreal Professional Powerdose is a in salon treatment that features core to surface technology to target all areas of the hair strand providing instant, deep conditioning and shine. 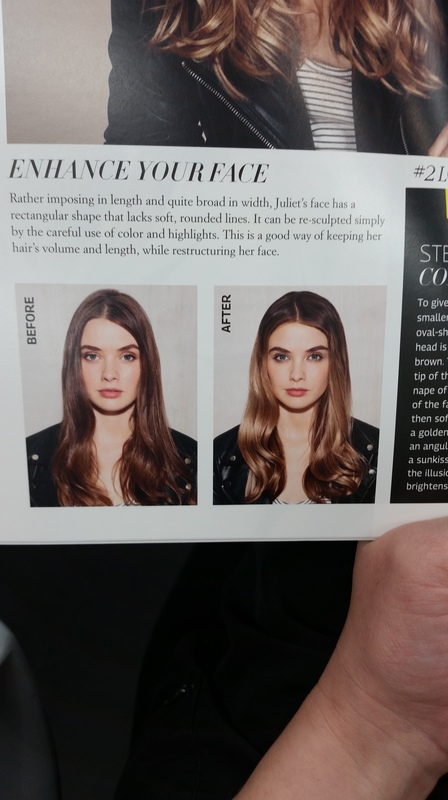 This treatment is a deep conditioner that goes down into your hair strand and works from the inside out. It helps repair damage after coloring or highlighting. It strengthens the hair and adds a ton of shine. It helps seal in your color to make it last longer. It last in the hair up to 3 weeks Most of our clients get one after every color. 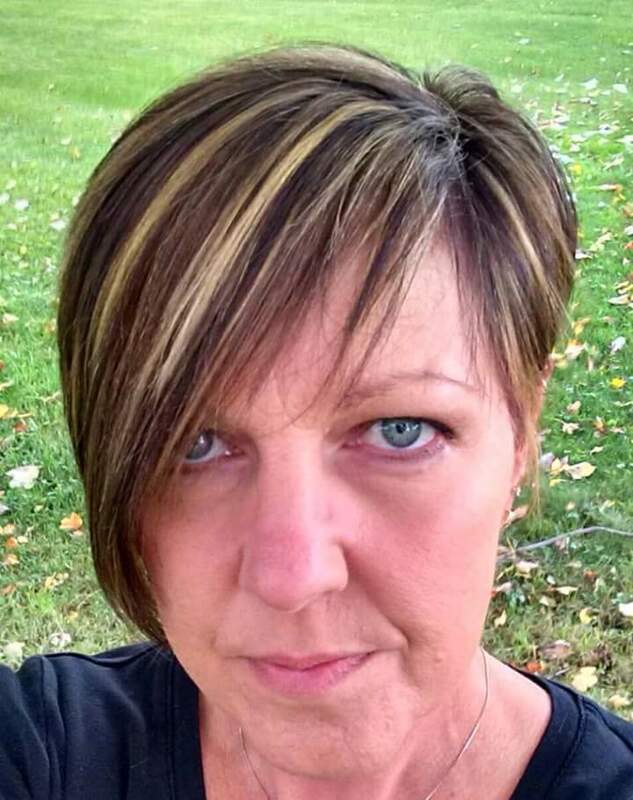 Some clients even stop in the salon in between colors to get the treatment since it wears out of the hair after 2 to 3 weeks (depending how often you shampoo your hair). I can always tell when my powerdose has wore out and I need another one. My hair goes back to being dry, tangled and frizzy. Once I am powerdosed again the frizz is contained, and the shine returns. These treatments are done at our shampoo bowls. 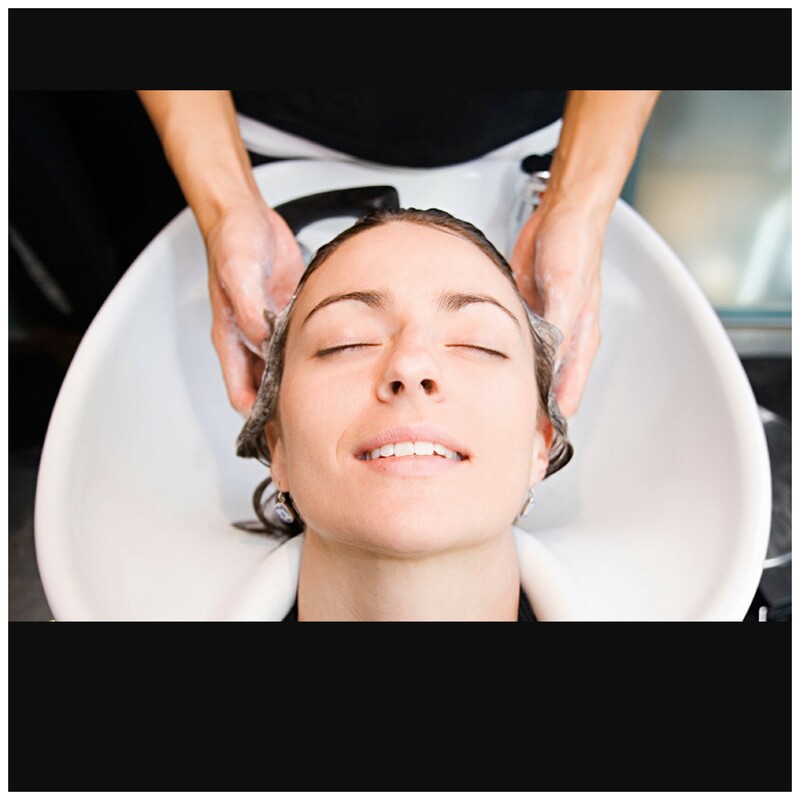 You are 1st shampooed to cleanse the hair of products and any other impurities. We then towel dry the hair extremely well and then place a towel or padding under the neck for added comfort. The Powerdose is then sprayed into the hair and evenly dispersed. You then get pampered with a relaxing 5 min head and scalp massage. I think some clients secretly don’t even care what the powerdose does, they just want the massage;) Once the massage is over, we seal the treatment in by rinsing with cool water. You are then able to dry and style the hair and see your beautifully conditioned result. The treatment is $14.50. 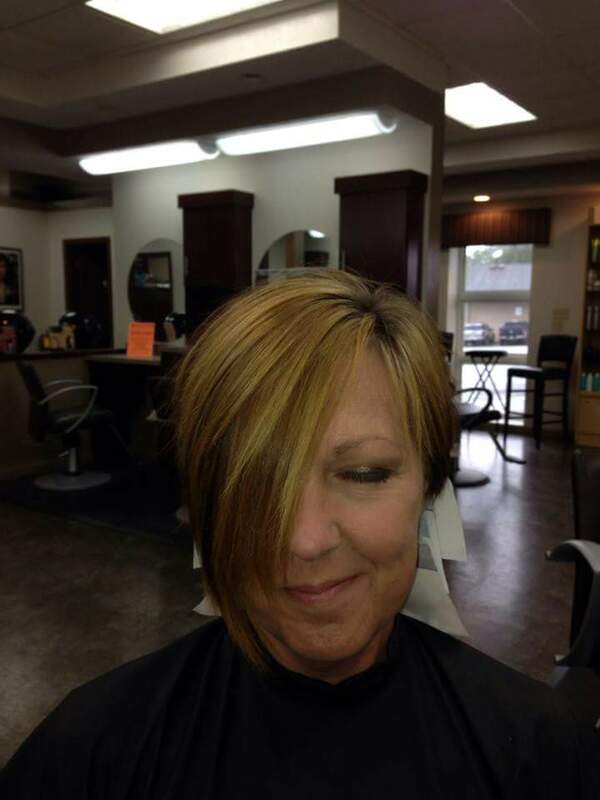 We have clients just stop in to get one quick and leave with their hair wet, or you can schedule a 30min appointment and have your hair dried and styled after. Call or stop in today and get your Powerdose! 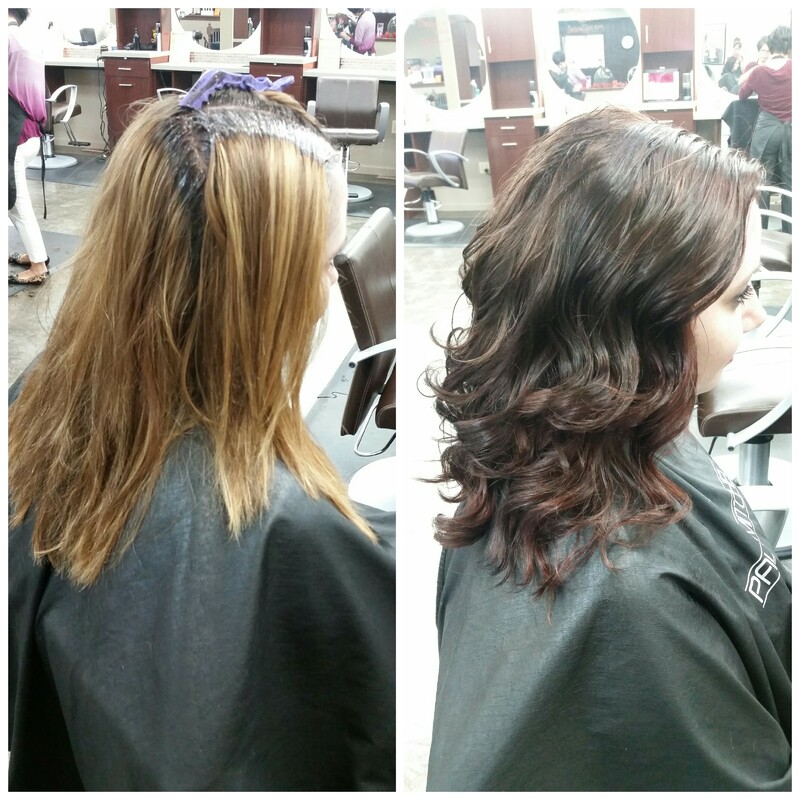 Want a New look for Fall? 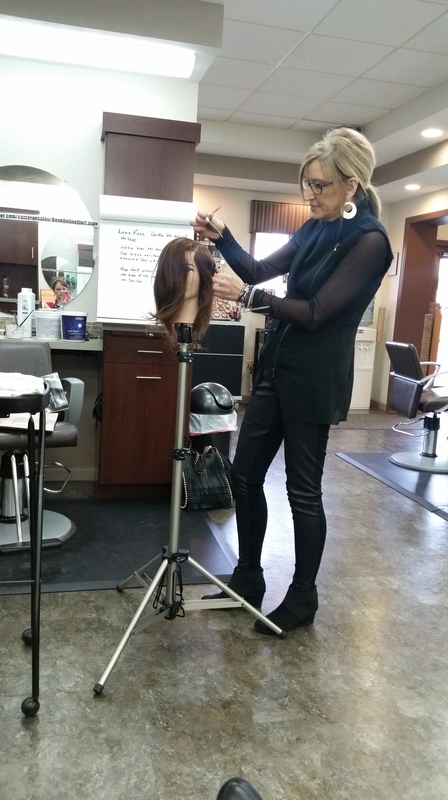 Typically in the salon, around the time school starts we start to see a trend with alot of clients in our chairs. They’re all sporting light, bleached out, beat up, dry hair. A combination of the summer sun and heat hitting their hair, pool chemicals and ocean water soaking it and pony tail holder upon pony tail holder pulling it up on those hot summer days has usually wreaked havoc on the color, and sometimes the overall integrity of the hair. So what do we suggest to these clients? ? Usually 1 of 2 things…..Products, or a New Color. Another great, VERY popular trend for fall- REDS!! Anything red. 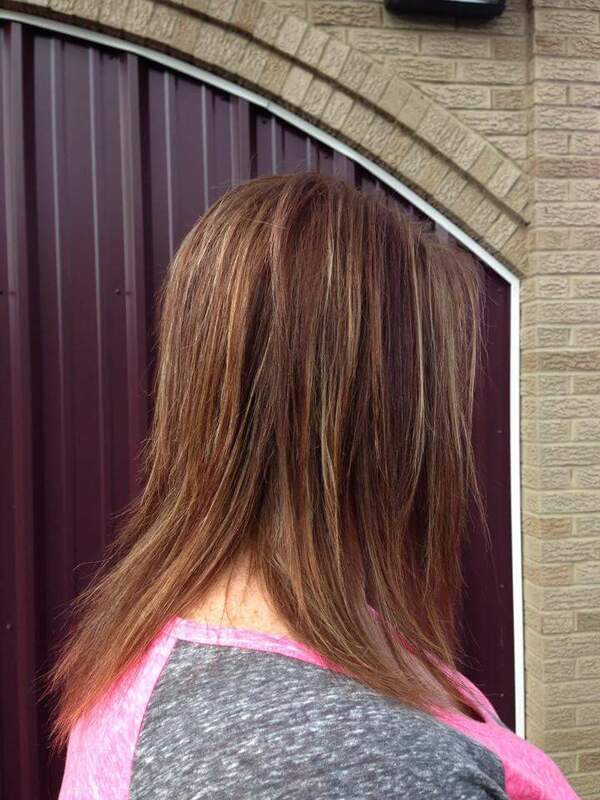 Lowlights, all over color, dimensional reds in ombres and balyage. 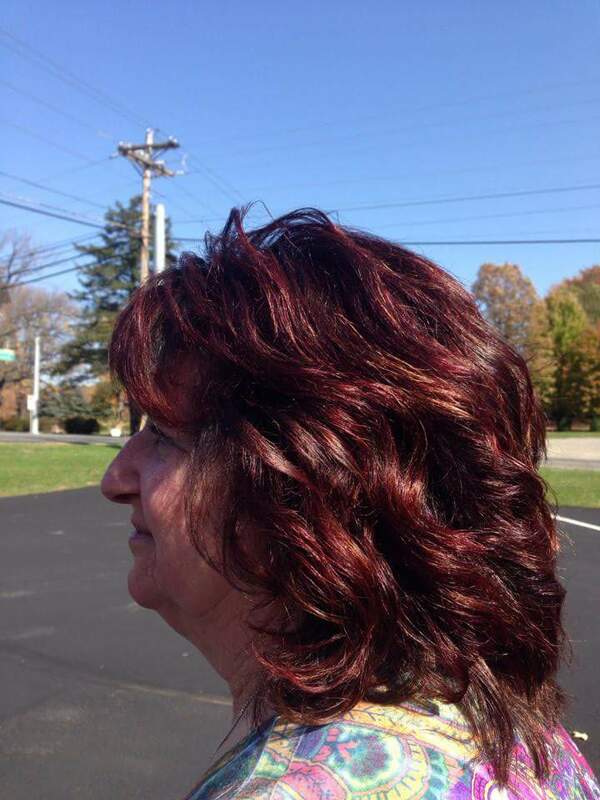 We have seen SO many reds leave the salon in the last few months and they are beautiful!!! 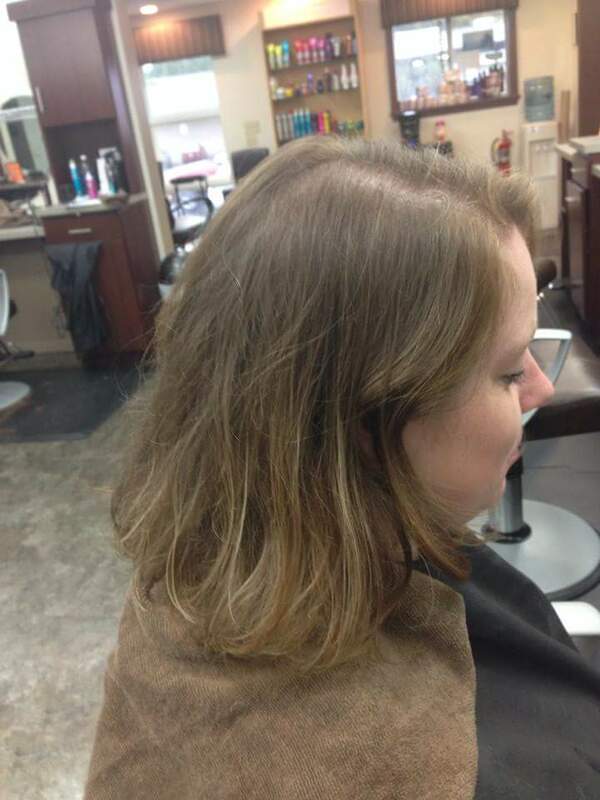 As you can see, your options are limitless for a new look for fall! 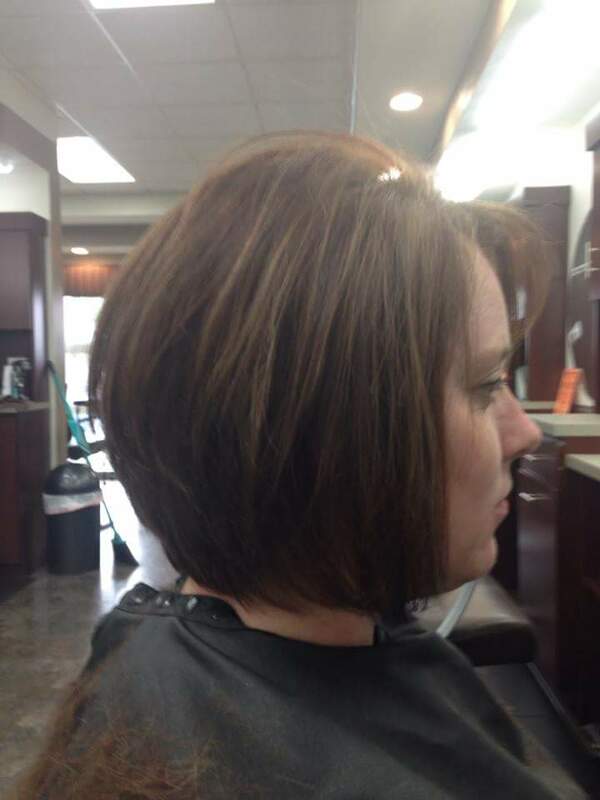 Call (724-349-5444) or make your appointment through our website today ( http://www.cameronsalon.com ) and get started on your new fall look too!! We cant wait to show you what we can do for you for the fall season! Looking for a great skin care line? Looking to find your best skin EVER?? Try Dermalogica! Dermalogica’s skin care systems are each designed to address a specific set of concerns to help you achieve your best skin ever. Not sure where to start?? Ask your stylist for a skin analysis to diagnose your skin’s needs and get a personalized regimen to meet that need. Here are some of the skin regimens Dermalogica offers. Daily Skin Health- Whether your skin is oily or dry, our unique daily formulas will help maintain and balance moisture levels. Age Smart (my personal favorite!…..more about that later)- Controls skin aging at the source while helping to stimulate collagen production, increase elasticity and promote smoothness. UltraCalming – Our most gentle formulas provide serious relief for even the most sensitized skin. MediBac Clearing- Adult acne has met its match with around the clock breakout clearing and prevention. Daylight Defense- The ultimate in sun protection and care, these elegant formulas protect and help repair skin exposed to damaging UV rays. We currently are running a promotion in the salon if you spend $60 on any Dermalogica products you get a free gift. 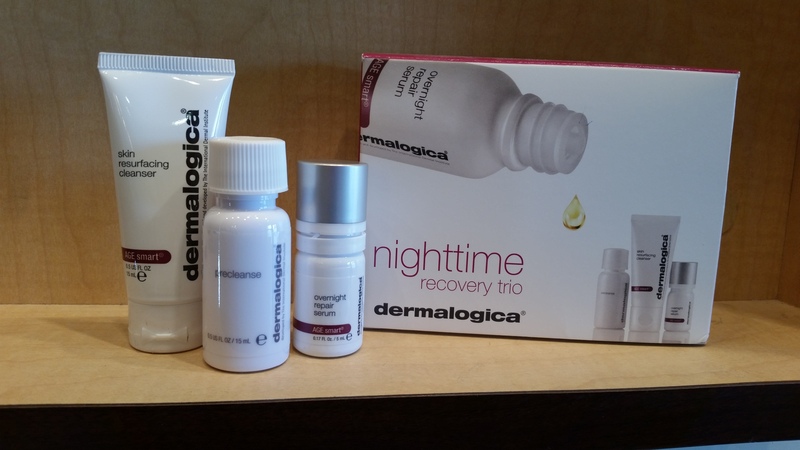 The Free gift is the nighttime recovery trio. Included in this kit is trial sizes of Precleanse, Skin resurfacing Cleanser and Overnight Repair Serum. PreCleanse- Oil based cleanser melts away impurities with Kukui, Apriocot and Borage seed oils as the first step of the Dermalogica Double Cleanse. Start with Precleanse before using your appropriate dermalogica cleaner. Skin Resurfacing Cleanser- Dual action exfoliating cleaner with Rose flower Oil helps retexturize aging skin. Overnight Repair Serum- Supercharged peptide formula with Argan and Rose oils helps stimulate cellular repair. 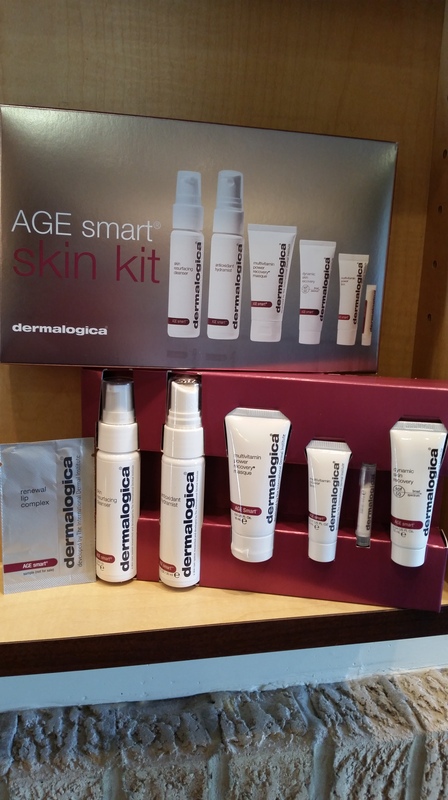 I mentioned my favorite Dermalogica line being the Age Smart line. It produces real, visible results. Many enviromental triggers contribute to the structure and breakdown of skin, leading to wrinkles, loss of skin tone and hyperpigmentation that leaves skin visibly aged. Age Smart targets these reactions with high tech peptides, antioxidants, active plant botanicals and polyphenols for your most visible restored and renewed skin ever. Whether you’re struggling with with early signs of aging around the eyes, or your skin demands complete skin renewal and exfoliation, you can experience the power of Age Smart with the trial kit. Try a Trial kit!! The Trial kit comes with 6 mini Age Smart products enabling you to try the line for a month to month and a half. This is plenty of time to see how you like the line and see results for your own skin. They run $52 and we have them in stock most of the time. Stop in and pick up one of these, or any of our Dermalogica products and start seeing the results for yourself! You won’t regret it!!! Have questions? ? Feel free to ask below in the comment box or seek out one of our stylists. We’d love to help you find the best product for your skin care goals. 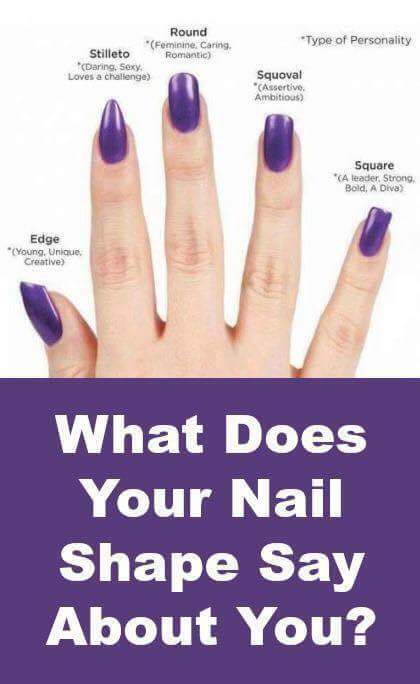 How Nail Services Have Changed-for the better! If you’ve ever had your nails done, whether it be for a wedding, holiday, any special occasion, Or even if you just love to have your nails done and go every other week to get them done…… what is the number one thing you are concerned with?? – HOW LONG WILL THEY LAST??!! Having done nails for over a decade in the salon, I have seen many trends come and go, and learned many valuable tricks. When I first started doing nails, things like applying a double layer of top coat polish and then topping it with Drip dry to help it dry faster helped our clients get a little more life out of their manicure. They could usually make it 3 to 4 days (at best) until their nails started to chip. 3 to 4 days was great if you were getting your nails done for a 1 day special event you needed them to look nice for, but what if you were going on vacation for a week?? What if you had a job interview on Tuesday, and had to get your nails done the Saturday before? ?What is you got your nails done for your Saturday wedding on Friday, but then had to do alot of decorating Friday night after getting them done- usually resulting in chipped up polish. It was very obvious that clients desired something that lasted longer and stayed nice and shiny the entire life of their manicure. Acrylic nails gave clients this desired look- 2 weeks of beautifully manicured nails with shiny polish or pretty french tips. The fall back- acrylics wreaked havoc on everyone’s nails, destroying the natural nail underneath. Plus then you always had the fear in the back of your mind ” what if I break/lose a nail?”. 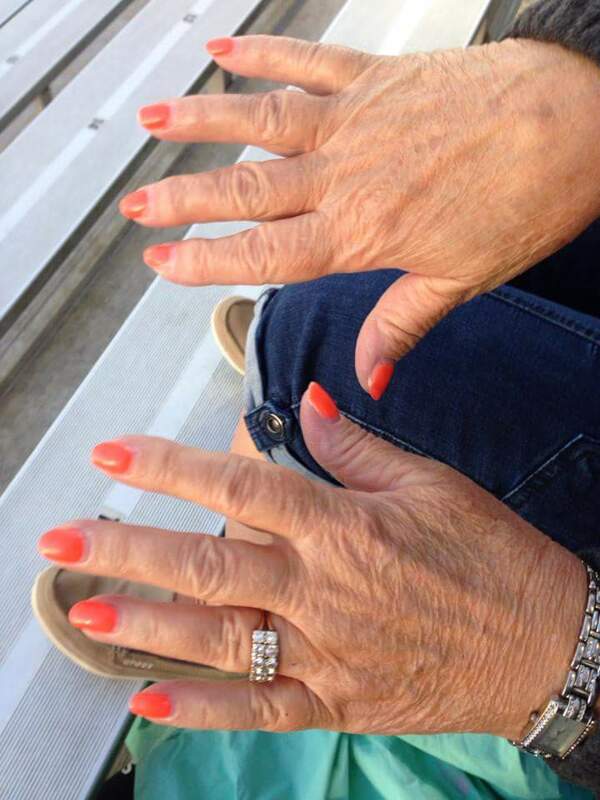 Fast forward a few years and the world of Gel Polish was introduced to the salons. My 1st run in with Gel Polish was about 5 years ago at a hair show in Chicago. A coworker and I stood and watched a live Demo where they put this gel polish onto peoples nails and toe nails and then added glitter on top of them making them “glitter nails”. They were GORGEOUS!!! We were in love!! We brought the products home with us and started doing glitter nails in the salon and they were a instant hit!! The problem? 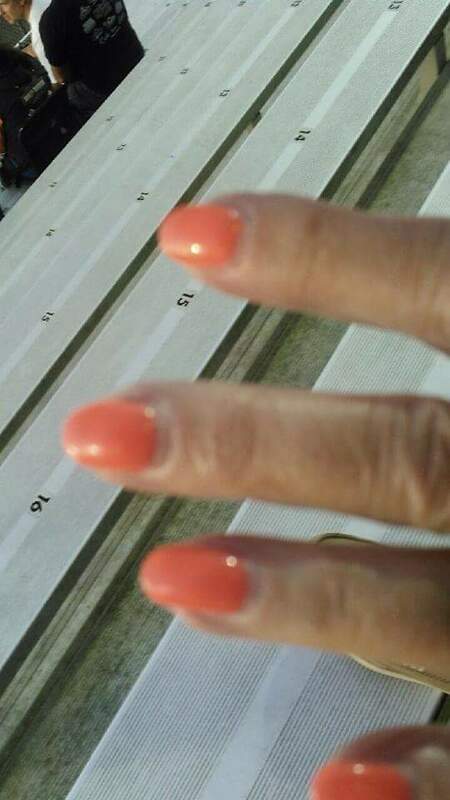 Although it was a awesome service and the nails looked great once they were done, It took a long time to do them, and the only way to remove them was to file them off, one by one with a hand held nail file…which took FOREVER!!!! We continued to do the glitter nails in the salon, but in the back of our mind we knew there had to be a better, easier solution!! The following year we went to a hair show in Orlando, Florida. My coworker and I saw something called GELLISH. It was also gel polish, but what set this product apart was 2 things. You applied it from a nail polish bottle exactly like you would regular polish, Not with a long nail brush like the other gel polishes we had used in the past. Much easier application! It could be soaked off!!! No need for hours of filing!! We were really excited to try this product and brought some home with us to try! The Gellish was a HUGE success. It looked great. It was so easy to apply. Clients were getting 2 – 3.5 weeks of wear out of it! It only took about 30 min from start to finish to apply it! Clients nails were able to grow with the Gellish on them cause it made their nails stronger while wearing it. What a great service!! We currently have about 80 colors of Gellish to choose from. We also currently have the holiday RED collection to choose from. *I say all that to say this- If you are looking for a long term wear polish, Gellish is definitely for you!! I have had clients come in at 3.5 weeks after getting a Gellish application, and it still looks perfect, its just grown away from their cuticle! The photos below are of a Gellish manicure after 20 DAYS!!!!! Gellish Polish is definitely the most popular polish choice in our salon these days. We still do mostly regular polish for pedicures, as polish stays on toe nails much longer then finger nails anyway. To use regular polish in a manicure service is rare these days. Clients do however still like the option of doing their own nails at home- So we always carry a large selection of regular polish to purchase. 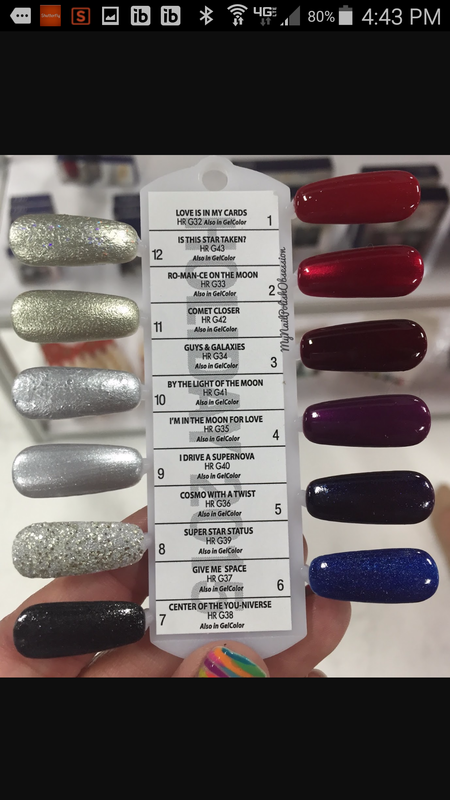 Pictured below are the new OPI starlight and Morgan Taylor holiday collections both currently available in our salon. If you like to change your polish color often, I would stick to the regular polish. I’m a bit of a nail polish junkie I will admit. I like to try lots of different colors, So I find myself buying 2 or 3 bottles from every new collection:-). If you like to get your nails done every 2 weeks and don’t want to think about them in between- then the Gellish is for you!! Love getting nail art?? NO worrries- that can be applied over the Gellish polish too! :-) If you haven’t tried Gellish for yourself yet, you definitely should!! If you’d like to check out our holiday polish collections- stop in!! Call in or get on our website http://www.cameronsalon.com and book your Gellish, Manicure or Pedicure appointment today!! Sick of doing the same thing with your hair every day?? 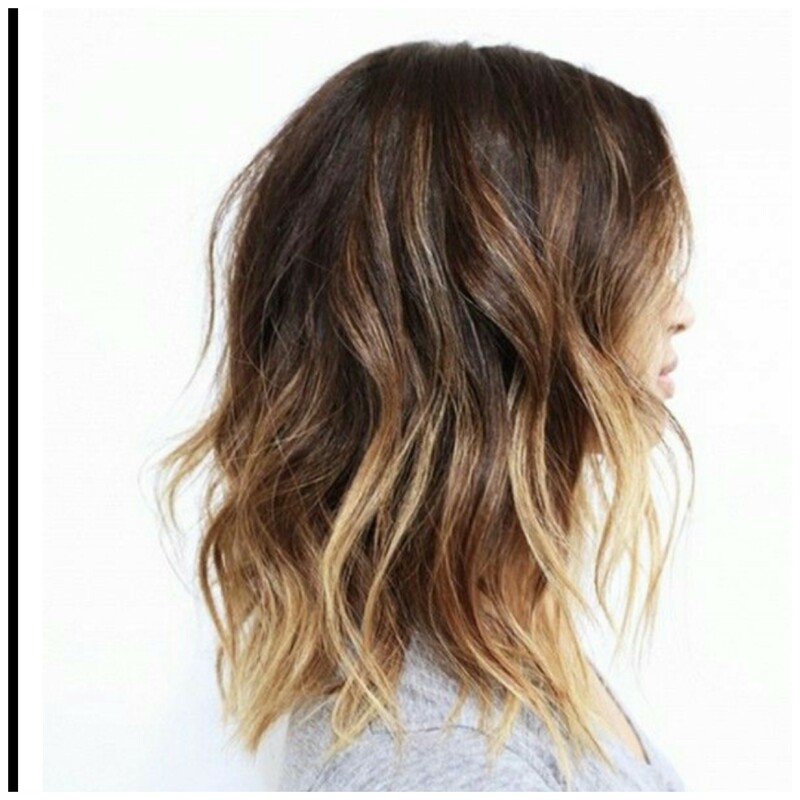 Need a quick, easy style idea that still looks like you did something with your hair and put some time in to it?? 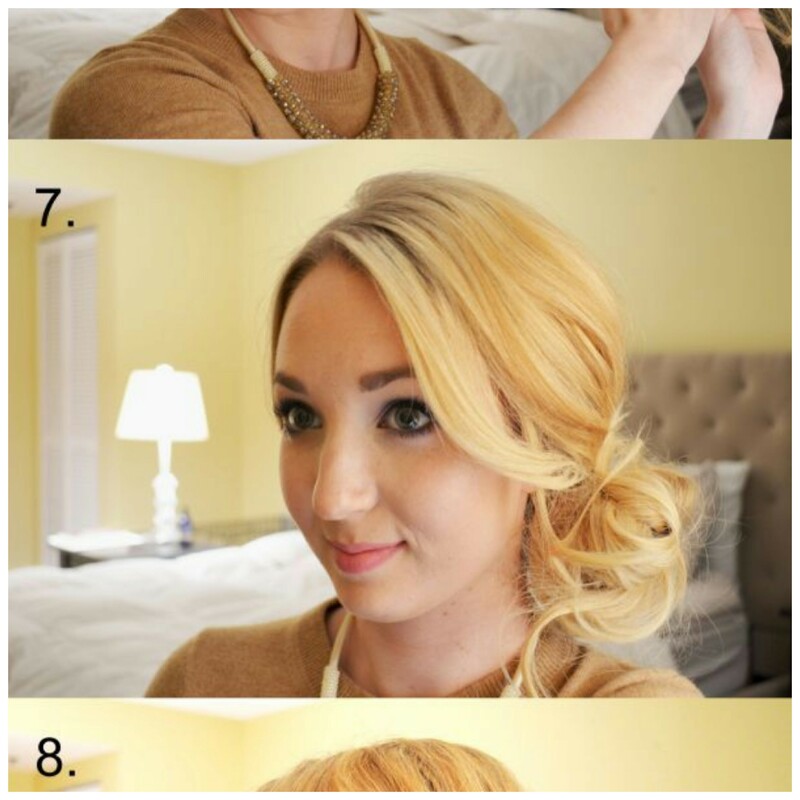 Here’s a step by step photo tutorial of a style you can try that would be cute for a holiday event, any special occasion or even just a day in the office. Give it a try! Let us know how you like it in the comment section below! 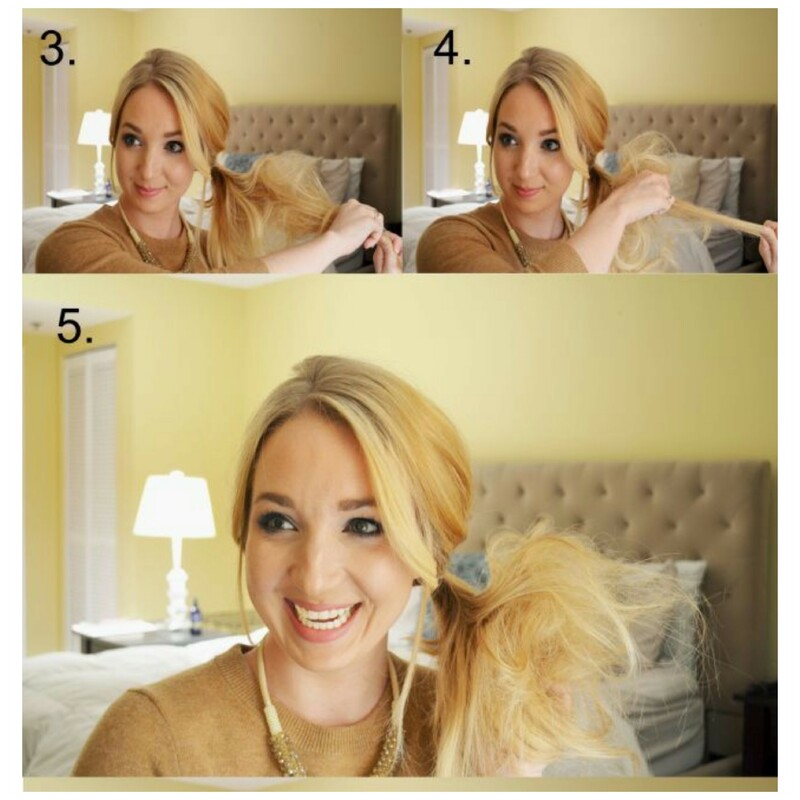 Pull into a side ponytail with a rubber band. If you prefer more volume, tease the crown area 1st before putting in ponytail. Hold onto the end of your pony tail with one hand and with the other pull towards the base of your ponytail so that the hair starts to gather there almost giving it a teased effect. 6. Take the ponytail and start to twist it. 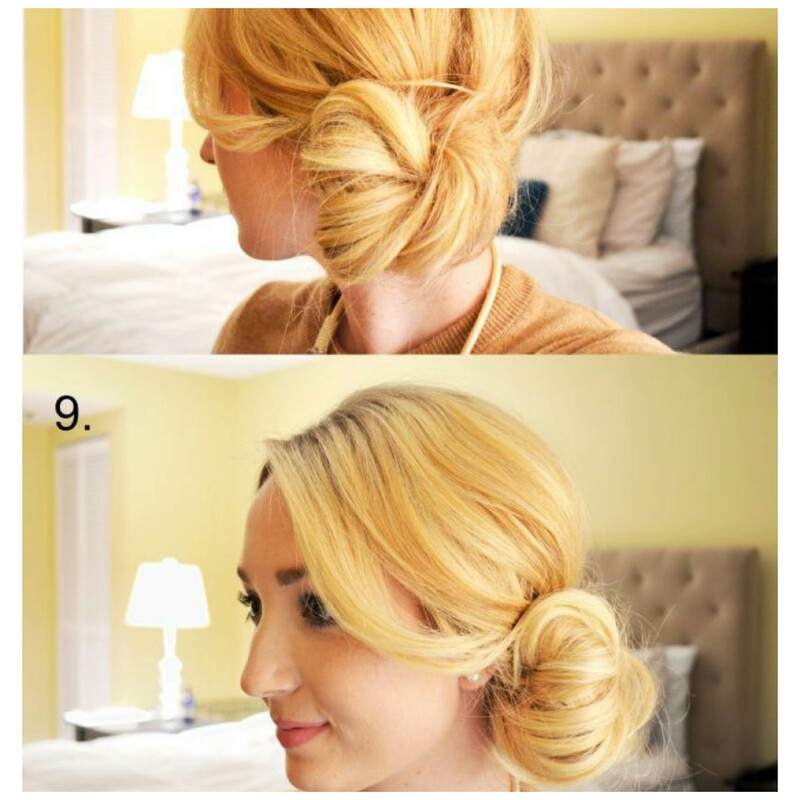 The looser the twist, the bigger the bun, the tighter the twisting the smaller the bun. 7. 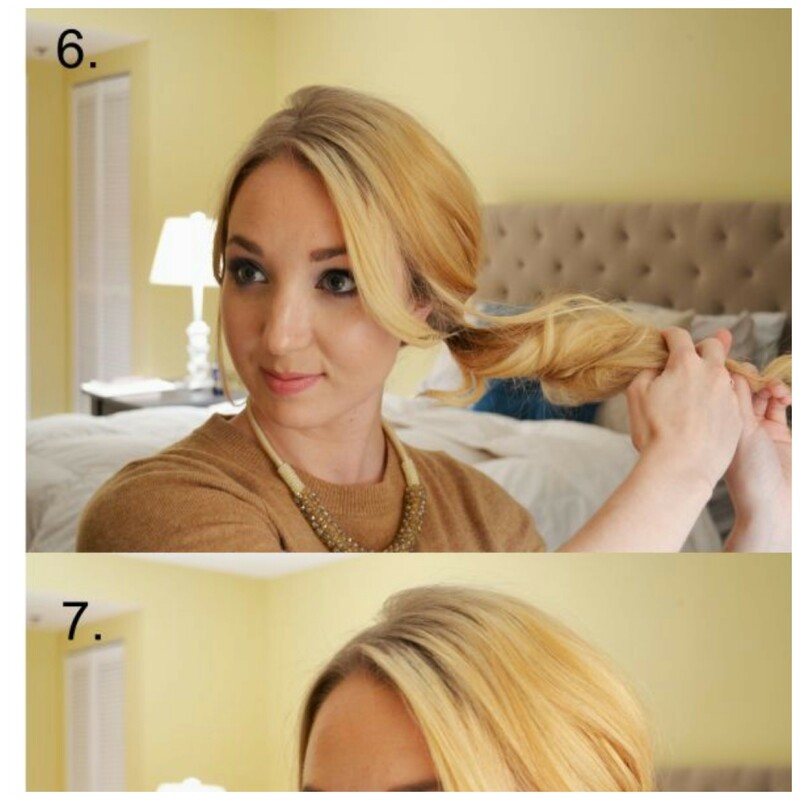 Once twisted, wrap and twist the hair around the ponytail holder into a bun shape. Use bobby pins to secure it where you want it. It may take a few trys to get the placement right. Just keep checking it with a mirror til you are happy with the result. Other views of the end result shown below in photos 8 and 9. Voila!!!! 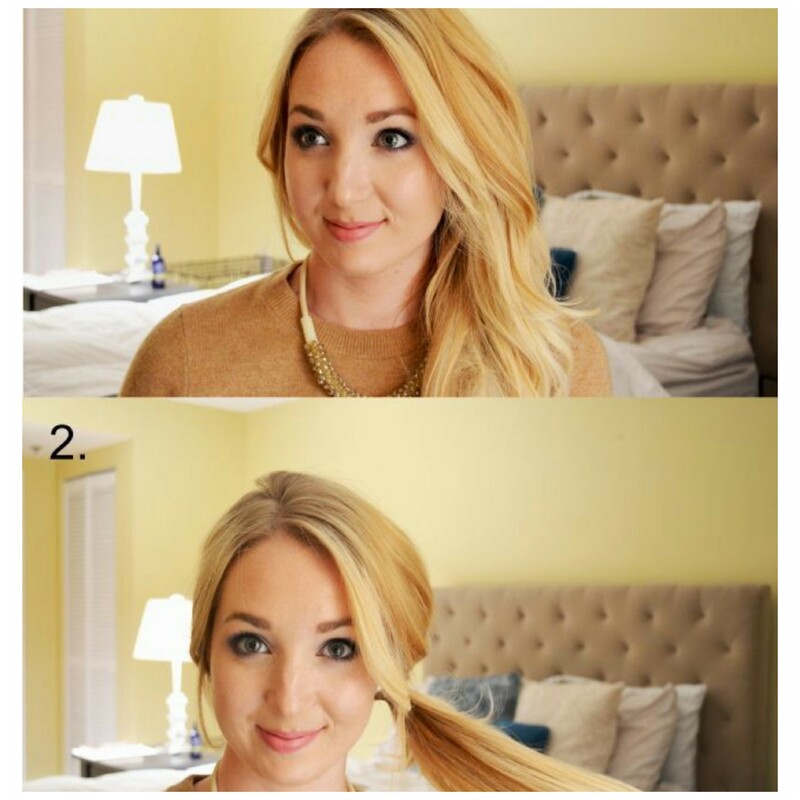 A brand new, super cute, quick and easy to do style to add to your hair styling regimen.